Abstract: On the southeastern slope of the Baranec Mount in the Western Tatra Mountains (Slovakia) an apatite-rich pegmatite-like segregation was found in the subvertical fault zone cutting metapelitic rocks. Two zones: felsic (F) and mafic (M) were found, differing in mineral assemblages and consequently in chemistry. Fluorapatite crystals yield a LA-ICP-MS U-Pb age of 328.6 ± 2.4 Ma. A temperature decrease from 634 °C to 454 °C at a pressure around 500 to 400 MPa with oxygen fugacity increasing during crystallization are the possible conditions for formation of the ­pegmatite-like segregation, while secondary alterations took place in the temperature range of 340 – 320 °C. The Sr-Nd isotope composition of both apatite and whole rock point toward a crustal origin of the dike in question, suggesting partial melting of (P, F, H2O)-rich metasedimentary rocks during prolonged decompression of the Tatra Massif. The original partial melt (felsic component) was mixed with an external (F, H2O)-rich fluid, carrying Fe and Mg fluxed from more mafic metapelites and crystallizing as biotite and epidote in the mafic component of the dyke. Abstract: A comprehensive revision of 981 specimens of fossil cockroaches from the Lower Cretaceous laminated limestones of the Crato Formation of Northeast Brazil shows that they belong to eleven taxa, including Piniblattella limai, P. magna sp. n., Perlucipecta santanensis. sp. n., Raptoblatta waddingtonae; Ocelloblattula santanensis sp. n., Elisama brevis (= E. americana, syn.n. ), E. hindwingnii sp. n., Ponopterix axelrodi (= P. maxima syn.n. ), Umenopterix burkhardi comb. n., and Cratovitisma oldreadi (Umenocoleidae = Cratovitismidae syn.n. = Ponopterixidae syn.n.). The family Ectobiidae is numerically most abundant in the assemblage of cockroaches of the Crato Formation (83 % of cockroaches), followed by Blattulidae (13 %) and Umenocoleidae (4 %). 79.2 % of specimens are complete and fully articulated. Members of the family Alienopteridae are probably also present. Representatives of a relatively common Mesozoic superfamily Caloblattinoidea are missing. With the exception of the endemic genera Cratovitisma and Raptoblatta and the exclusively Gondwanan genus Ocelloblattula, all other genera were cosmopolitan. 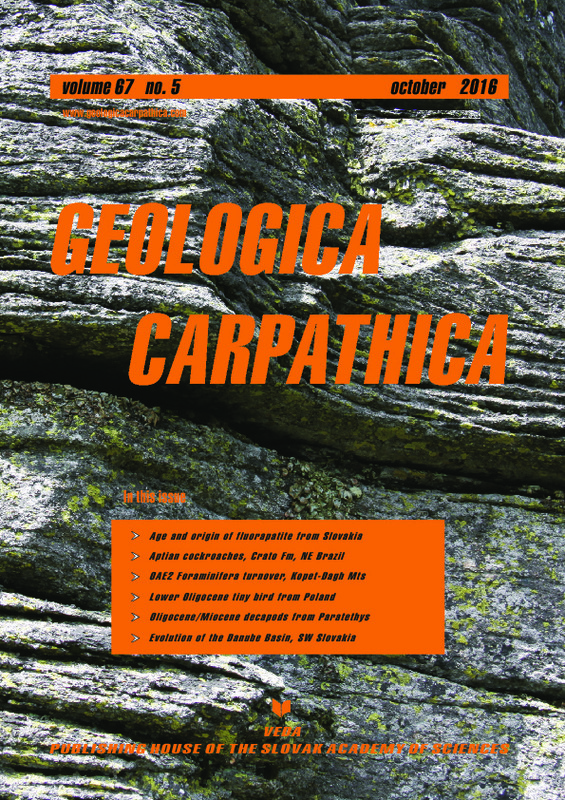 Taxonomic richness of cockroaches of the Crato Formation is thus rather low, and consists of geologically long-ranging and geographically-widespread genera, genera restricted to Gondwana, and short-ranging endemic genera found in the Crato Formation only. Abstract: Two Late Cenomanian – Early Turonian (C–T) intervals of the eastern part of the Kopet-Dagh basin, NE Iran have been investigated to evaluate the response of planktonic foraminifera to the geological event OAE2. The Gharesu and Taherabad sections with the thicknesses of 30 m and 22.5 m are composed of shale and marl interbedded with glauconitic sandstone. Three biozones Rotalipora cushmani, Whiteinella archaeocretacea and Helvetoglobotruncana helvetica were recognized based on study of planktonic foraminifera, in these sections. We observed the patterns of planktonic foraminiferal assemblage changes around the C–T boundary and divided this succession into several ­successive intervals. This study confirms that OAE2 was a long term event. A gradual perturbation in the study ­successions starts in the interval 1 with low abundance and diversity of planktonic foraminifera. An enhanced oxygen minimum zone (OMZ) occurs in the interval 3 which coincides with a temporary absence of planktonic foraminifera and sedimentation of framboidal pyrite. High diversity of planktonic foraminifera and appearance of new genera in the interval 5 indicate return of normal conditions to the basin. A significant short-term sea surface temperature cooling is also indicated by planktonic foraminiferal turnover and carbonate contents in the interval 2 which is comparable with other parts of the Tethys Ocean, Boreal sea and Atlantic region. Abstract: We describe an articulated partial leg of an Oligocene bird. It is one of the smallest avian fossils ever recorded. Its slender and exceptionally short tarsometatarsus, hallux as long as the tarsometatarsus and stout moderately curved claws agree with stem-group Apodidae (swifts), stem-group Trochilidae (hummingbirds), and stem-group Upupidae/Phoeniculidae (hoopoes/woodhoopoes). Unfortunately, due to the poor preservation of the specimen its more precise affinities remain unresolved. The specimen differs in many details from all other tiny Palaeogene birds and therefore most probably it represents a new taxon but it is too fragmentary to describe it. It is just the twelfth avian fossil from the Oligocene marine deposits of the Outer Carpathians and Central Palaeogene Basin — a huge area that covers south-eastern Poland, north-eastern Czech Republic and northern Slovakia — and therefore it adds to our very limited knowledge on the avifauna of that region. The remains of land birds from Jamna Dolna and other sites of the region can be attributed to the general sea level fall at that time, which led to limitation of the connection with the open ocean and resulted in many shallow shoals, temporary islands and exposed dry land areas along the coast. Abstract: Decapod associations have been significant components of marine habitats throughout the Cenozoic when the major diversification of the group occurred. In this respect, the circum-Mediterranean area is of particular interest due to its complex palaeogeographic history. During the Oligo-Miocene, it was divided in two major areas, Medi­terranean and Paratethys. Decapod crustaceans from the Paratethys Sea have been reported in the literature since the 19th century, but only recent research advances allow evaluation of the diversity and distribution patterns of the group. Altogether 176 species-level taxa have been identified from the Oligocene and Miocene of the Western and Central Paratethys. Using the three-dimensional NMDS analysis, the composition of decapod crustacean faunas of the Paratethys shows significant differences through time. The Ottnangian and Karpatian decapod associations were similar to each other both taxonomically and in the mode of preservation, and they differed taxonomically from the Badenian ones. The Early Badenian assemblages also differed taxonomically from the Late Badenian ones. The time factor, including speciation, immigration from other provinces and/or (local or global) extinction, can explain temporal ­differences among assemblages within the same environment. High decapod diversity during the Badenian was ­correlated with the presence of reefal settings. The Badenian was the time with the highest decapod diversity, which can, however, be a consequence of undersampling of other time slices. Whereas the Ottnangian and Karpatian decapod assemblages are preserved virtually exclusively in the siliciclastic “Schlier”-type facies that originated in non-reefal offshore environments, carbonate sedimentation and the presence of reefal environments during the Badenian in the Central Paratethys promoted thriving of more diverse reef-associated assemblages. In general, Paratethyan decapods exhibited homogeneous distribution during the Oligo-Miocene among the basins in the Paratethys. Based on the co-occurrence of certain decapod species, migration between the Paratethys and the North Sea during the Early ­Miocene probably occurred via the Rhine Graben. At larger spatial scales, our results suggest that the circum-­Mediterranean marine decapod taxa migrated in an easterly direction during the Oligocene and/or Miocene, ­establishing present-day decapod communities in the Indo-West Pacific. Abstract: The tectonic evolution of the pre-Cenozoic basement, as well as the Cenozoic structures within the Danube Basin (DB) and its northern periphery are presented. The lowermost portion of the pre-Cenozoic basement is formed by the Tatricum Unit which was tectonically affected by the subduction of the Vahicum / Penninicum distal continental crust during the Turonian. Tectonically disintegrated Tatricum overlaid the post-Turonian to Lower Eocene sediments that are considered a part of the Vahicum wedge-top basin. These sediments are overthrust with the Fatricum and Hronicum cover nappes. The Danube Basin Transversal Fault (DBTF) oriented along a NW– SE course divided the pre-Neogene basement of the DB into two parts. The southwestern part of the DB pre-Neogene basement is eroded to the crystalline complexes while the Palaeogene and Mesozoic sediments are overlaid by the Neogene deposits on the northeastern side of the DBTF. The DBTF was activated as a dextral fault during the Late Oligocene – Earliest ­Miocene. During the Early Miocene (Karpatian – Early Badenian) it was active as a normal fault. In the Middle – Late Miocene the dominant tectonic regime with NW – SE oriented extension led to the disintegration of the elevated pre-Neogene basement under the simple and pure shear mechanisms into several NE – SW oriented horst and graben structures with successive subsidence generally from west to east. The extensional tectonics with the perpendicular NE – SW ­orientation of the Shmin persists in the Danube Basin from the ?Middle Pleistocene to the present.